Bonhoeffer Research at the United States Holocaust Memorial Museum (USHMM) in Washington, D.C. The USHMM has extensive archival and library resources pertaining to the history of Nazi Germany, the Holocaust, and related topics. Because the USHMM library collects comprehensively with respect to the history of the Holocaust and Nazi Germany, it has a definitive collection in different languages of published works about the churches during the Nazi era, the German resistance, Bonhoeffer, and related topics. In addition, the library has an extensive rare book collection that includes many original pamphlets and publications from the Kirchenkampf. The Museum’s collections of oral histories, photography and films also include relevant material. Finally, the Museum holds hundreds of archival collections, either as original documentation, on microfiche, or in digital form. These archival holdings include documentation from Nazi regime offices such as the Reichssicherheitshauptamt, international organizations like the Quakers, and collections from private individuals who have donated their papers to the Museum. Scholars continue to find new information in all these collections. A recently acquired collection is the Carl and Robert Gamer papers, particularly the material collected by Dr. Carl Gamer. Gamer, who was a Methodist minister, wrote his dissertation on the free churches in Germany under National Socialism. This collection contains his research notes, his diary, and other materials he collected while doing research in Nazi Germany in 1938 and 1939. During this period Gamer attended numerous church events, lectures, and rallies, including Confessing Church services in Dahlem, and collected a number of pamphlets and other publications from different church and political organizations. The American Friends Service Committee (AFSC) Refugee Assistance Case Files encompasses over 20,000 individual case files of people who approached the AFSC for help in emigrating from Nazi Germany or Nazi occupied territories. There are at least two files specifically related to Dietrich Bonhoeffer: the files for Herbert Jehle, a pacifist and close friend of Bonhoeffer’s who was imprisoned in the Gurs camp before coming to the United States, and Hans Wedell, a converted Jew who was married to Bonhoeffer’s cousin. Given the scope of the collection, it is possible that there are other individual files that contain information relating to Bonhoeffer. A more comprehensive collection of Kirchenkampf material is the microfiche of Der Kirchenkampf - the Gutteridge-Micklem Collection at the Bodleian Library, Oxford. This collection consists of 515 microfiches of theological and political documents (dated from 1930 to 1969), including books, periodicals, pamphlets, correspondence, reports, memoranda and manuscripts relating to the German Protestant Church Struggle and the Roman Catholic Church in Germany, collected by historian Richard Gutteridge and British theologian Nathaniel Micklem. The Museum also has a copy of the World War II era records of the World Council of Churches on microfiche. While the records of the International Tracing Service were created primarily to assist survivors and families of people who perished in the Holocaust, these records are also a valuable source of primary documentation, and more and more researchers are beginning to study them. 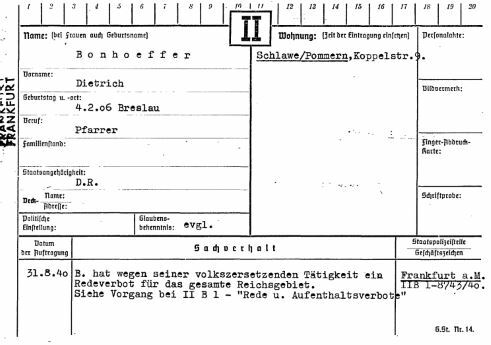 A name search for Dietrich Bonhoeffer pulls up several records, including a record from the Frankfurt Gestapo heaquarters of the 1940 Gestapo order banning him from speaking in public (image shown here). The text of the original Gestapo order appears in volume 16 of the Bonhoeffer Works (p. 71); it is possible that there is additional relevant material from Tegel and Flossenbürg.